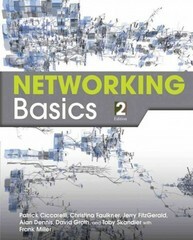 Introduction to Networking Basics 2 Edition The 2nd edition of Wiley Pathways Networking Basics addresses diversity and the need for flexibility. Its content focuses on the fundamentals to help grasp the subject with an emphasis on teaching job-related skills and practical applications of concepts with clear and professional language. The core competencies and skills help users succeed with a variety of built-in learning resources to practice what they need and understand the content. These resources enable readers to think critically about their new knowledge and apply their skills in any situation.